Midnight Syndicate to release new Carnival Arcane CD August 2nd. 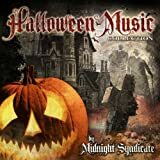 July 14, 2011 (Cleveland, OH) Gothic horror soundtrack musicians MIDNIGHT SYNDICATE will be releasing their fourteenth studio album, entitled CARNIVAL ARCANE, on August 2nd. “The theme of the new disc surrounds the Lancaster-Rigby Carnival, a shadowy, turn-of-the-century traveling circus with more than a few skeletons in its closet,” said Edward Douglas. “The Victorian and Edwardian eras are a big source of inspiration for us. They also marked the beginning of the heyday for traveling carnivals, so that’s the time period we chose to set the disc in. We spent a lot of time researching early-20th century circuses and carnivals to ensure that the sounds and music work together to really immerse you in this world and the time period. There’s also a big tip of the top hat to Mr. Bradbury whose work inspired many of the more horrific elements that appear in the latter half of the disc.” CARNIVAL ARCANE also features the vocal talents of Jason Carter (LORD OF THE RINGS: BATTLE FOR MIDDLE EARTH, BABYLON 5, THE DEAD MATTER) and fellow THE DEAD MATTER cast members Brian Van Camp, and Dennis Carter, Jr. The CD will be available through the Midnight Syndicate website, Amazon, iTunes, as well as at Halloween retailers nationwide. It will also be available at select Hot Topic stores starting August 8th. Preview tracks will be made available on the band’s Facebook page and website shortly. From the CD insert:The train smoke drifting through the pale moon light signals the arrival of the Lancaster-Rigby Carnival. In a forest clearing, these mesonoxian visitors await your arrival. Stroll along the midway and behold wonders both fantastic and macabre from every corner of the globe. And be sure to ride their one of a kind carousel for an experience you’ll never, ever forget. In September of 2009, AOL released a list of the Top 10 Best Halloween Music CDs of all time as ranked by AOL/CBS Radio listeners. Three of the ten CDs were Midnight Syndicate discs (#8, #4, and #3) ranking only behind Danny Elfman's Nightmare Before Christmas and John Carpenter's iconic Halloween soundtrack. For more information on Midnight Syndicate, visit the official Midnight Syndicate website.